There’s a long-lost graphic design student within me that yearns to do work like this, but at this point I can fully appreciate its quality and beauty without having to be someone who creates items like these. 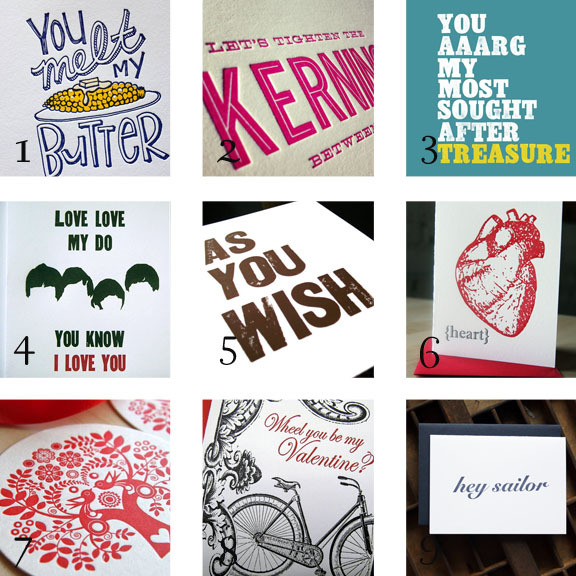 With the day of hearts and flourish next week, I wanted to share some letterpress valentine’s I have been spying lately on Etsy. I love me some Valentine cards. Every year, until this year, I buy the funny grade school kind from the grocery store. Cards with Strawberry Shortcake on them saying “I think you’re a very sweet Valentine!” I don’t think I can get away with those shenanigans anymore, so I’ve set my sight on swankier salutations. 1. I don’t know what I like more about this valentine from Echo Letterpress, the fact that I love corn-on-the-cob or that is reminds me of summer in the bitterness of February. Happy Love Day Paula Dean. 2. I love this one from 1331Design. Nothing like a little graphic design humor. Hehehe.